As the average age of the world’s population goes up (looking at you, baby boomers), so does the demand for anti-aging products and services. While there has been a steady increase in the market for the past few years, Zion Market Research has found that the anti-aging market will be worth $216.52 billion by 2021, with a CAGR of 7.5% between 2016 and 2021. The market is divided into anti-pigmentation therapy, anti-adult acne therapy, breast augmentation, liposuction, chemical peel and hair restoration treatment, as wells as several other categories. 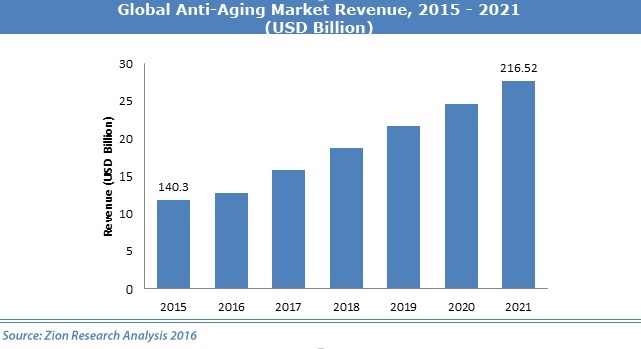 Companies such as Personal Microderm, Alma Lasers Ltd., L’Oréal, Allergyn Inc., Cynosure Inc., Solta Medical Inc. and Beiersdorf AG play a key role in the anti-aging market.